It was the 1960’s – a time to reach for the sky! 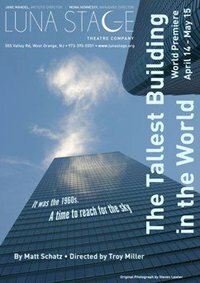 Luna Stage proudly presents the world premiere of The Tallest Building in the World by Matt Schatz, an entertaining and inspiring new play about the construction of the World Trade Center Towers---one of the grandest achievements in the history of engineering. The production runs for five weeks, Thursdays through Sundays, beginning on Thursday, April 14th, with the first of five preview performances. Opening night is Friday, April 22nd, and the show closes on Sunday, May 15th. All Thursday performances begin at 7:30pm, Fridays and Saturdays are at 8pm, and Sunday matinees are at 2pm through May 15th, 2011. Tickets are on sale now, $20-$30, on the Luna Stage website, www.lunastage.org, or by calling 973-395-5551. The theatre is located at 555 Valley Road, West Orange, NJ, in the heart of the Valley Arts District of Orange and West Orange. With equal measures of ego and genius, a low level bureaucrat at The Port Authority sets out to build the world’s tallest building — an easy task, as long as he can get his architect, his engineer, the owner of the Empire State Building, and the Laws of Physics to cooperate. Based on actual events, The Tallest Building in the World examines the 1960s birth of the World Trade Center towers and the partnerships and friendships that were tested along the way. David Bonanno leads the outstanding cast of five as “Gino”, the engineer turned bureaucrat who must manage all the temperaments and egos to get his project off the ground. Mr. Bonanno has appeared on Broadway in Light in the Piazza, directed by Bartlett Sher at Lincoln Center Theater, and recently completed a tour with Christopher Lloyd as Howard in Death of a Salesman. Pun Bandhu portrays “Yama”, the temperamental and reluctant architect who must reinvent his craft to rise to this challenge. Mr. Bandhu received his MFA from the Yale School of Drama and was in the world premieres of AR Gurney's Far East (Williamstown Theatre Festival, directed by Daniel Sullivan) and Theresa Rebeck's The Bells (McCarter Theatre Center, directed by Emily Mann), among others. He can be seen in the upcoming film "Two Days in New York" opposite Chris Rock. Kane Prestenback plays “Lee”, the brash young engineer whose revolutionary ideas hold the key to the project’s success or failure. Kane recently made his London Theatrical debut at The Old Vic with the TS Eliot US/UK Exchange, hosted by Kevin Spacey, in Anna Moench's Halo/Titanic. Rounding out the cast are two ensemble players who give life to all of the opposing forces: The Port Authority, displaced Radio Row merchants, and even an iconic building or two. Drew Dix founded a theater company in the West Village (Theater In Action) and directed the company’s operations from 1981-1991. He has performed at the North Carolina Shakespeare Festival, the 78th St. Theater Lab and various theatres on Theatre Row and does voice over work with Motion Capture Studios in Manhattan. Nehassaiu deGannes performed with Alec Baldwin in EQUUS at Guild Hall. Additionally, she has performed in numerous productions at LaMAMA in NYC and regionally at Trinity Rep.
Playwright Matt Schatz is also a lyricist, composer, and bookwriter whose other full-length plays and musicals include Love Trapezoid, a finalist at the O’Neill National Music Theater Conference and Yale Institute for Music Theatre; Exchanges, with music by Michael Kooman; and The Baby is Blue. He is a three-time recipient of an EST/Sloan Commission and has been a finalist for the Fred Ebb Award and the Page 73 Playwriting Fellowship. Troy Miller, who is directing the production, holds an MFA in Directing from Trinity Rep in Providence, RI, and is making his Luna Stage debut with The Tallest Building in the World. He has been a finalist for the Sir John Gielgud and Mark Okrent Fellowships. His past directing credits include Craig Lucas’ Bathroom Humor at Playwrights Horizons and – as both director and choreographer - The Bully with Vital Theatre and Together This Time:A Rock Musical for the NY International Fringe Festival. The Tallest Building in the World is the final production of Luna Stage’s inaugural season in The Valley Arts District. The play was originally commissioned by The Ensemble Studio Theatre/Alfred P. Sloan Foundation Science and Technology Project and was read in Luna’s New Moon Play Reading Series in the fall of 2009. Cheryl Katz, Director of Play Development at Luna Stage, says about the play: “Of course, it is not possible to even mention the words World Trade Center without evoking memories and emotions associated with the terrorist attacks of September 11th, 2001. In a unique way, this play addresses the tragedy that occurred ten years ago, because from the perspective of the present, audiences cannot help but see in these past events, the future." Album Review - Jennifer Hudson's " I Remember Me"